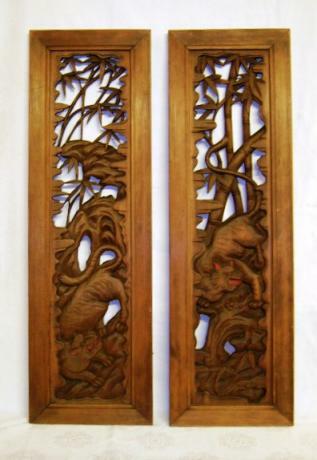 Japanese Early 20th Century pair of carved verticle wooden RANMA. The RANMA are carved in the design of tigers and bamboo. Beautifully carved in great detail and with much expression. The reverses are not carved. Each panel measures 13 1/2" wide and 43" tall. 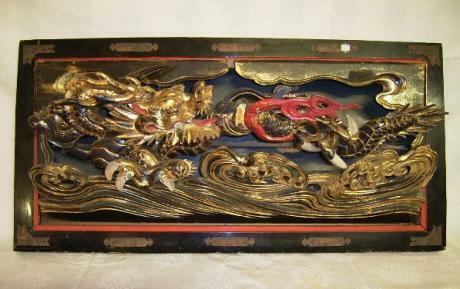 Japanese SHOWA Period carved, lacquered and gold leaf covered RANMA of dragon. The dragon is beautifully carved in high relief and with great movement. The dragon is covered in gold leaf and black and red lacquer and is framed within a rectangular frame done in black and red lacquer. 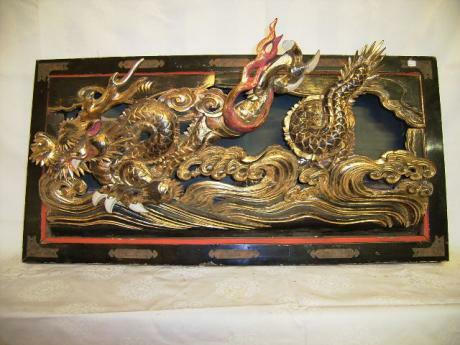 There is als..
Japanese SHOWA Period carved, lacquered and gold leaf covered RANMA of dragon. The dragon is beautifully carved in high relief and with great movement. The dragon is covered in gold leaf and black and red lacquer and is framed within a rectangular frame done in black and red lacquer. 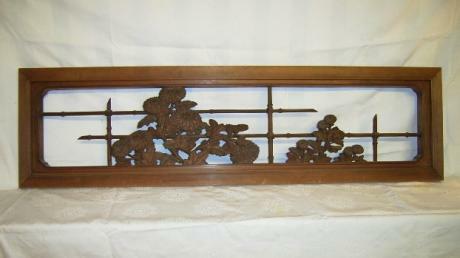 There are al..
Japanese MEIJI Period carved wooden RANMA of chrysanthemums and bamboo support fence. The chrysanthemums and bamboo are beautifully carved in high relief and with great detail. The back of the RANMA is also carved in the same precision and detail. The RANMA measures about 61 1/2" long, 17" tall an..
Japanese Edo Period carved wooden RANMA. A wonderfully designed and carved wooden RANMA. This RANMA originally hung down from the corner of a building from just under the roof. The RANMA measures 25" long by 9" tall by 1 1/2" deep. 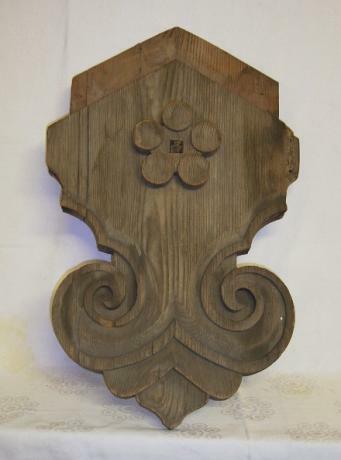 Japanese 19th century carved wooden element. Beautifully carved with great design and detailing. 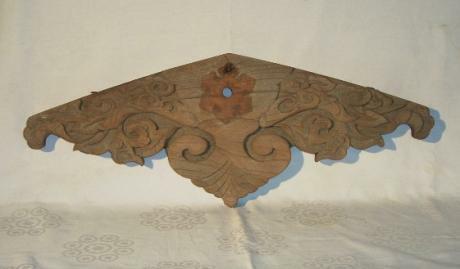 This piece originally hung hanging from above, with its top fitting into an upper beam or support. The piece measures 31" tall, 18" wide by 2" thick. The RANMA has some old damage from insects. Japanese Edo Period carved wooden RANMA. 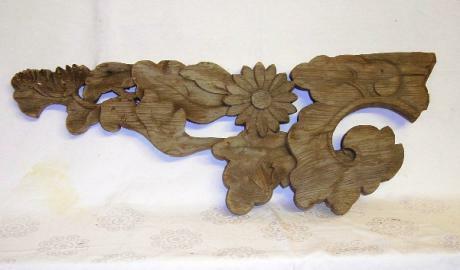 A wonderfully designed and carved wooden RANMA of waterlily leaves and blossoms. This RANMA originally came from the right side of a building. Please also look at the mirror image pair to this piece FC-58(2). The RANMA measures 35 1/2" long by 13" tall ..
Japanese Edo Period carved wooden RANMA. 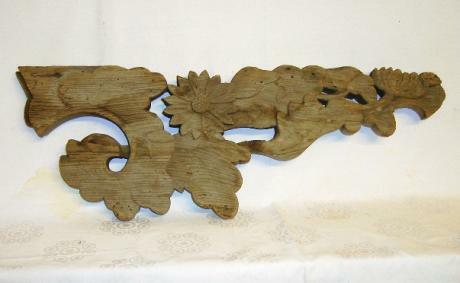 A wonderfully designed and carved wooden RANMA of waterlily leaves and blossoms. Please also see the mirror image of this RANMA in FC-58. The RANMA measures 35" long by 12 1/4" tall by 2" deep. The RANMA has some old insect holes. Japanese 19th Century carved wooden RANMA. 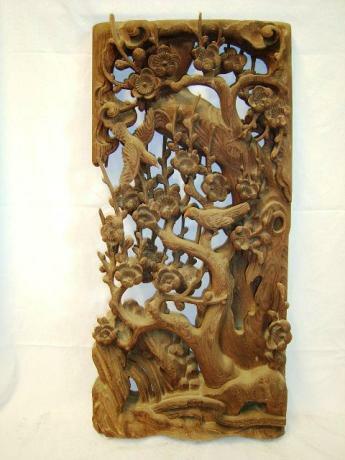 The deeply and expertly carved wooden RANMA has the design of nightingales within the blosssoms and branches of a plum tree. The piece measures 15" wide, 31" tall and 3 1/2" deep. 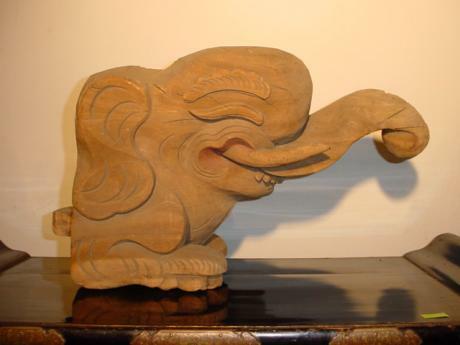 Japanese 19th Century carved elephant head. This architectural piece is carved from a single piece of wood. Beautifully carved with a lot of detail and expression. The piece measures 19" wide, 12" tall by 7" deep.